Karen Terry of JMJ Creations keeps us all afloat over at the Unique Women in Business (UWIB) Etsy Team! She lets us know when new members have joined, spearheads special promotions on the UWIB Blog, gives us advice, listens to our woes, and still finds time to make awesome jewelry! 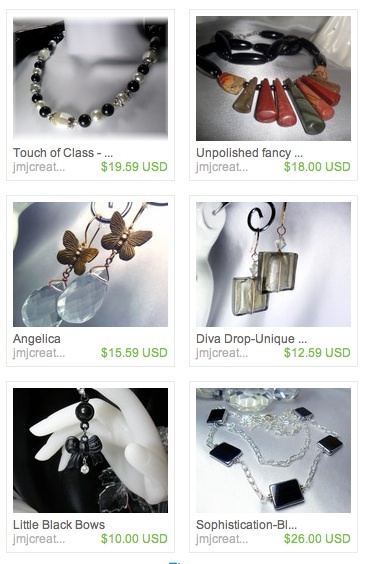 Karen says in her ETSY profile, "Jewelry designing has become my passion as well as my hobby. My hope is that you will wear my creations with the same enjoyment and pride as I had making them!" I know that several pieces have been snatched up by our own UWIB members and I'm sure you will find something that tickles your fancy too! Here's a sampling of Karen's awesome artistic pieces! So stop by Karen's shop and browse some more! -Ziploc Steamer Bags - fresh veggies here I come! - 1 day closer to spring and warmer weather that will stick around for more than a day or two - snow forecasted for tomorrow! Thank you so very much Rita! I am honored to be featured on your blog! AND I love Unique Women in Business Yahoo Group!!!!! Wonderful feature Rita! We all Love Karen!! Wonderful profile, Rita on a lady that is easy to love and a wonderful artist. Thanks for sharing that!